Anyone who's lived in Japan for a few days will have heard of the epic game Final Fantasy. Starting way back in the 1980s, it's now up to like Final Fantasy 13 or something, and shows no signs of ever stopping. I've never played myself, but I'm familiar with the role playing game scene, having played D&D when I was a kid, as well other geeky computer games like 'Ultima' and 'A Bard's Tale'. Anyway to commemorate the 10 year anniversary of Final Fantasy 7, (considered by experts in these matters to be the best version of the game), Suntory has teamed up with Square Enix to let the public try some of the various potions found in the games. Pretty exciting! 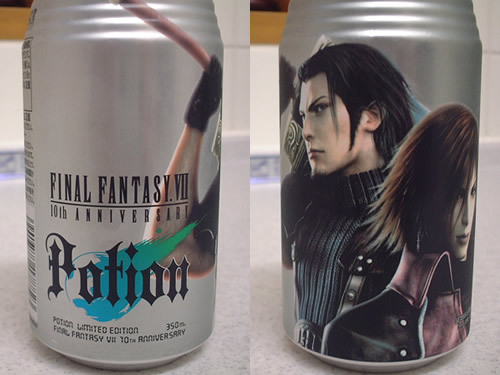 The cans don't say what kind of potion is inside, but instead have various pictures of the guys and girls from Final Fantasy VII, Crisis Core. What guys and girls? You know, Cloud Strife, Zack Fair and the gang. The cans were selling fast so I ended up with one with Genesis and Angeal Hewley on it. Who are they? No idea really. Unfortunately, the ones with those hot anime girls were sold out. 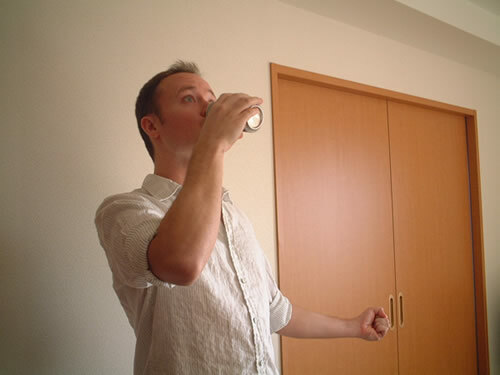 On the can it boasts ingredients like royal jelly, and all the B vitamins from 1 to 12. So what kind of powers will it give me? Invisibility? Frost giant strength? Let's find out! Hmm, tastes kind of like those genki drinks you buy in the stores. Wait! ....What's happening to me!!?? 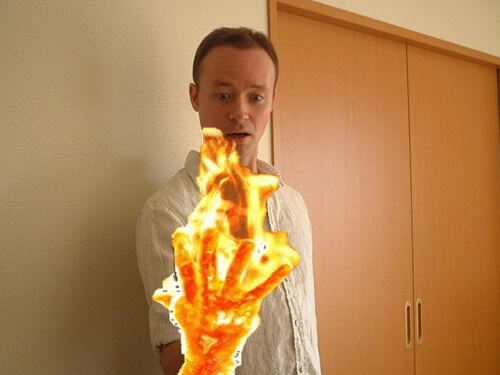 Turns out that the potion I got lets you shoot fireballs from your hands, which may sound cool, but is actually not useful at all in real life unless you want to set someone on fire or burn down the city. I ended up sitting around holding my flaming hands out in front of me for a couple hours before it finally wore off. Any cans left? Silly me, I only bought one. At 200 yen each they're selling fast and may already be sold out across the land. If you find any, please remember, with great power comes great responsibility. Try not to kill anyone or destroy important things.